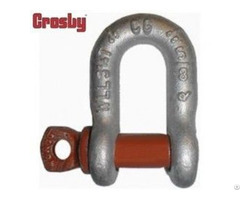 Crosby G 2140 Bolt Type Alloy Anchor Shackles are Forged Alloy Steel 30 thru 175 metric tons. Cast Alloy Steel 200 thru 400 metric tons. Working Load Limit is permanently shown on every Crosby 2140 Bolt Type Alloy Anchor Shackles. All sizes of Crosby G 2140 Bolt Type Alloy Anchor Shackles are individually proof tested to 2.0 times the Working Load Limit. 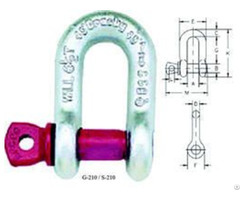 Pins of Crosby G 2140 Bolt Type Alloy Anchor Shackles are galvanized and painted red. 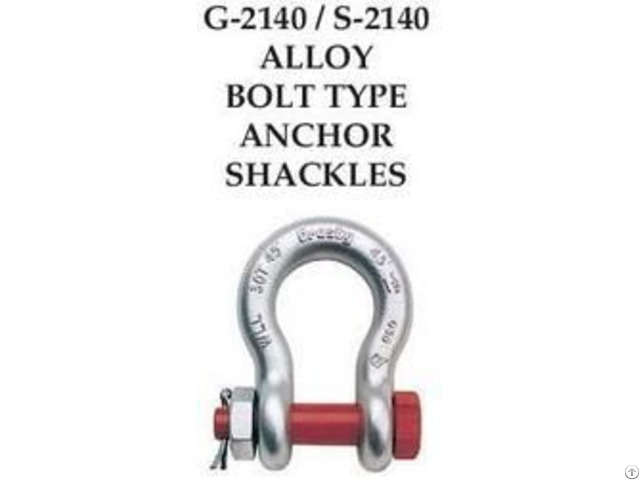 Crosby G 2140 Bolt Type Alloy Anchor Shackles are Quenched and Tempered and canmeet DNV impact requirements of 42 joules at -20 C.
Crosby G 2140 Bolt Type Alloy Anchor Shackles meet or exceed all requirements of ASME B30. 26 including identification, ductility, design factor, proof load and temperature requirements. Crosby 2140 Bolt Type Alloy Anchor Shackles meet other critical performance requirements including fatigue life, impact properties and material traceability, not addressed by ASME B30.26. 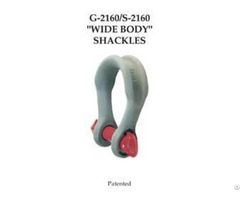 Shackles 200 metric tons and larger are provided as follows. Serialized Pin and Bow Material Certification (Chemical) Magnetic Particle Inspected. Certification must be requested at time of order.